Sycamores are a classic American shade tree. They are widely adapted and can be found gracing front yards and streetscapes from Seattle to Boston and from Atlanta to Los Angeles. Sycamores are massive trees eventually reaching more than 100 feet in height with a broad, spreading crown. Healthy trees are known to live for hundreds of years and can attain an impressive girth of 10 feet or more in diameter. The leaves are quite large, growing between 4 and 8 inches long and wide with three to five distinct points reminiscent of a maple leaf with numerous smaller serrated tips in between. In the fall, the leaves turn brown and bury the ground underneath the trees in a thick carpet. Sycamores are not known for their flowers, which appear on small green balls at the same time that the leaves emerge in spring. Their seeds are much more conspicuous, as they develop in spherical capsules about 1 inch in diameter and remain dangling from the branches long after the leaves drop in fall, like little ornaments. The aesthetic feature sycamores are most known for is their mottled, exfoliating bark. Sycamore bark has often been described as resembling desert camouflage with its patchwork of grey, brown, tan and whitish tones intermingling in a swirling pattern. 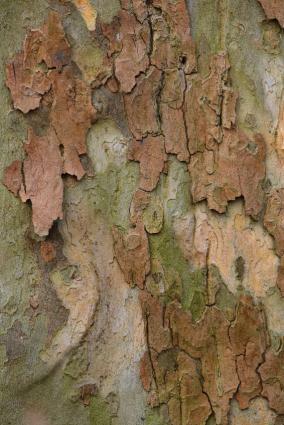 The bark also has the unique habit of continuously shedding itself in long strips, creating a striking appearance at ground level that makes it hard to mistake a sycamore for any other tree. USDA plant hardiness zones 5 to 9 are where sycamores are most at home, meaning they will tolerate winter temperatures as low as -20 degrees and are comfortable in hot climates, other than in desert areas. Sycamores don't mind partial shade when young, but they need space to grow up into the canopy to take advantage of the sunlight. They grow grow naturally in bottomlands, where the soil is rich and deep - mimicking these conditions when planting them in the home landscape is a sure recipe for success, but they are forgiving and will grow in a diverse range of soil types. Moisture is the one limiting factor with sycamores - in arid climates they need regular irrigation to survive and even in places with regular rainfall they benefit from being planted in low-lying areas that are naturally moist. 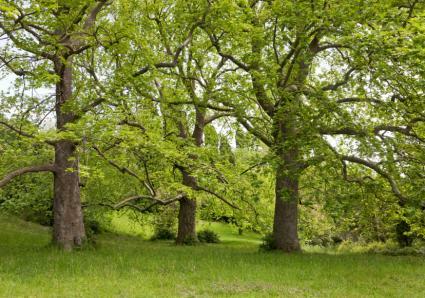 Once a sycamore tree is established, generally within 5 to 6 years after planting, it is unlikely to need much attention. However, the more it is pampered when young, the more likely it is to reach adulthood in good health. Give sycamores a deep soaking once per week in the first few years after planting and on a monthly basis thereafter. Spreading 1 to 2 inches of compost over the roots zone of young trees each fall helps to build the rich topsoil that sycamores love. Maintaining a deep layer of mulch over the root zone of the tree helps to conserve moisture and keep the roots cool. As the tree grows, prune off any branches on the lower half of the tree until the lowest branches are a minimum of 10 feet from the ground, at which point they can be left as the permanent scaffold branches for the life of the tree. Numerous pests and diseases prey on sycamores, which can shorten the life of this otherwise long-lived tree. In general, the size of the trees makes treating any problems that occur a job for a professional arborist. Aphids are common on sycamores, but generally cause no major harm to the tree; however, the thick black substance secreted by these sap-sucking insects can be a big nuisance where they hang over parking areas, pathways or patios. Anthracnose is a serious disease that causes dieback in the leaves and twigs of sycamores and can lead to their slow demise; there are fungicides that can help, but they can only be sprayed by an arborist who is licensed to do so. Lace bugs sometimes feed on the underside of sycamore leaves, causing a stipled appearance and can occasionally defoliate the tree; however, like aphids, a tree in good health will usually tolerate the attack and rebound. Providing ample irrigation and cultivating deep, rich topsoil around sycamore trees is the best prevention for the many maladies that can affect them. Tree suffering from drought stress are particularly vulnerable. Broken branches and split trunks are a sign that the tree developed with an improper branch structure. With trees the size of sycamores, this a serious concern, as life and property are at stake if a large branch comes crashing down. In this case, there is nothing a homeowner can do, but it is wise to consult with an arborist to see what steps can be taken to shore up a tree with a weak structure and prevent future calamity. 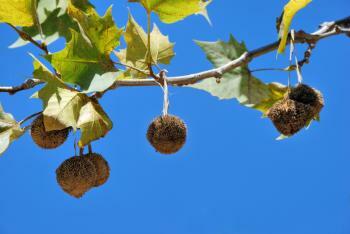 Sycamores are also known by the name of buttonwood tree or plane tree. There are a handful of species native to North America, Asia and Europe, though they all bear a fairly common resemblance. Columbia has an upright form and is known for having orange highlights in its bark. Liberty has a pyramidal form and is more resistant to anthracnose and powdery mildew than the common species. Bloodgood is an anthracnose-resistant cultivar with a rounded shape and a reputation for tolerating drought better than other varieties. 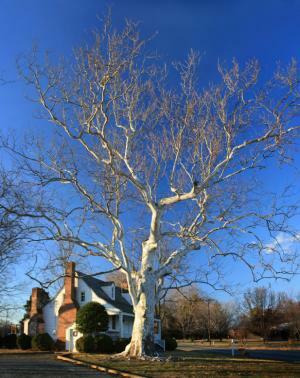 Planting a sycamore is something that needs to be considered carefully. Will it have the space and the growing conditions it needs to thrive? If not, it can be a messy disease-ridden tree. However, if you have a moist open area and would like the satisfaction of planting something that will give shade to future generations, it is a beautiful, stately species to choose.